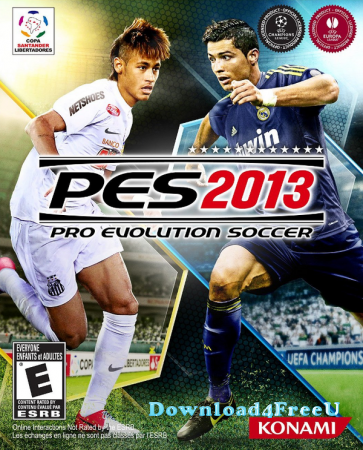 Kick off for thrilling soccer matches on the pitch with PES 2013: Pro Evolution Soccer. Experience the excitement and heart-racing action of the world's most popular sport on your PlayStation 3. Jump onto the pitch and compete against some of the top players in the sport thanks to the inclusion of the UEFA Champion's League and Copa Santander Libertadores Vie for glory against many of soccer's prolific personalities with the lifelike player models that have been upgraded to feature movements to appear more like the real-life players. Dribble and pass with more freedom than ever, and go up against top goalkeepers that are more true-to-life than ever before with improved animations, logic and responses. Take advantage of precise offensive and defensive controls to fire electric shots, execute pinpoint passes or to sway the momentum with strategic defensive stops and turnovers. Connect to and interact with other players thanks to the enhanced MyPES platform that links all online and offline gamers. At kickoff, do you want to be standing on the sidelines, or dominating the pitch?